I had to restore the MySQL DB from a backup and change passwords for all MySQL user accounts. Previously I already used that very same backup, and everything worked fine. Now I was able to bring up everything, which uses this MySQL instance (my web sites, jabber server, and a few other things - all of them happily took the new passwords and are working), but hMailServer. It is persistently giving me Access denied error for the specific user @'localhost', even though I can run mysql and log in with the same credentials. I tried playing with localhost vs IP vs host name to no avail. Sometimes I have to wait about 30 seconds to get this message, other times it pops up immediately. "Severity: 1 (Critical), Code: HM4354, Source: Application::OpenDatabase, Description: hMailServer failed to connect to the database server. Error message: Access denied for user 'hMailServer'@'localhost' (using password: YES)"
I edited the INI file, turned password encryption off, and changed the encrypted password to the same plain text password, which I changed the MySQL user's password to. I am no longer getting the MySQL error. Now when I am trying to run the admin UI, I am getting a message "the password is incorrect", then the password dialog. But the admin password, which I am using for more than 10 years and know it for certain, is not working anymore. Okay, I thought, probably the encryption of passwords applied not only to the MySQL password, but to the admin password too. So I replaced the encrypted admin password with the plain text, thinking it would work. Nope. I am still getting the same message about invalid password. How do I get my server back up? Some things in the INI file and the dialog for DB connections, that comes up after the error message, do not make sense. For instance, no matter what I enter in there: localhost, or the IP, or the host name, the INI only saves localhost. And by the way, I just uninstalled, reinstalled and configured the DB, but now I am also seeing line #2 in the error message, about the RPC server unavailable. What can be so horribly wrong in this simple INI file, that out of several softwares, only hMailServer absolutely cannot log into this DB? I can log in from any host on the network, using any number of different SQL clients (MySQL workbench, PHPMyAdmin, Squirrel SQL) but hMailServer cannot log in. Why? Any ideas? Last edited by DrmCa on 2018-12-22 04:30, edited 1 time in total. and in hMailAdmin set a new Adminstrator Password again. "The specified user name or password is incorrect"
and then it prompts for the admin password. And if I press Cancel, it takes me back to the DB connection dialog. But strangely, the server seems to be up and running! I just got an email, but still cannot log into the admin UI. where is your hmailserver.ini located? Solved those one, thanks for the tip about the blank admin password! the server came up w/o errors and I logged into the admin UI. So far so good, but! One question: is there a way to return to using the encrypted DB password? "ERROR"	5836	"2018-12-21 21:34:46.157"	"Severity: 2 (High), Code: HM5113, Source: SslContextInitializer::InitServer, Description: Failed to load certificate file. Path: D:\Program Files\Apache Software Foundation\Apache24\conf\ssl.crt\mydomain.crt, Address: 0.0.0.0, Port: 995, Error: use_certificate_file: No such process"
But since late last night I am not getting them, after simply re-entering the same path. And the annoyance is that every time I start the admin UI, it first alerts of invalid password, then pops up the password dialog. 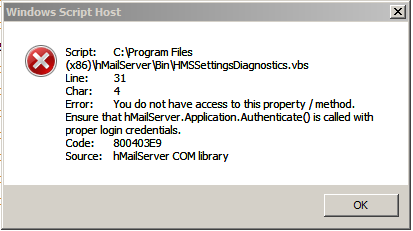 In hMailAdmin, you can setup a new Administrator password. and set it up new, a reasign it to,port 110. I know. I did that. When I set up a new password, I get this annoying popup about the wrong password. Then I click Ok, get the regular password prompt, enter the new password, and it logs me in. What am I missing? This is sounding a bit cryptic to me. First of all, I do not want SSL on port 110, as I have clients, who can only connect over 110 in plain text. I want SSL to be on port 995. What do you mean, delete it? There is a path to the cert, and that cert is shared among all services for this domain - Apache, jabber server, and several others including hMailServer. Only hMailServer is having a problem with it. So what exactly does it mean - delete and set up new? Cool! But what should I do if I have an SSL error on port 995? I had to tell all users to temporarily switch off SSL for POP and SMTP, how do I troubleshoot to allow them to turn this back on? So far, when I am trying to log in, connection is refused on 995. I only restored the DB, the certs and keys are the same for more than a year. When I set up a new password, I get this annoying popup about the wrong password. Then I click Ok, get the regular password prompt, enter the new password, and it logs me in. What am I missing? That the wrong password is saved. Am I missing any software to be installed? Wrong password. You need the administrator password. Right. Sounds like my admin password was left blank since I started getting the popup about it being invalid every time I opened the admin UI. I set it to some value, and here is the file. Is D drive a mapped network drive or a local drive? Genius! Thanks a lot, Matt! POP3 worked right away, but then Thunderbird threw me to a loop, as when switching connection security on POP it changes 110 to 995, but when on SMTP it leaves it at 25 and for a while I was staring at the progress bar when sending. Then realized that, switched 25 to 465, and it is working.